The oral application of bacteria in aquaculture is an area where the science supports some approaches and the market place is full of many who sell products that cannot deliver what is claimed. It is well known that shrimp have relatively primitive immune systems and that they can not be immunized in the classical sense of the word. They do respond to the presence of foreign materials, including dead microorganisms of many different types. Inclusion in the feed is a good idea even if the bacteria are dead, given that the costs of inclusion are relatively low. AquaPro F contains the same spores (and a few others) found in our other products. Inclusion into the feed is not the same as including living bacteria (or dead for that matter). The heat from the milling process may kill some of the spores, but in general they are quite resistant to heat. One kg of AquaPro F contains 4 trillion Bacillus spores (this is what we guarantee although counts are typically higher). 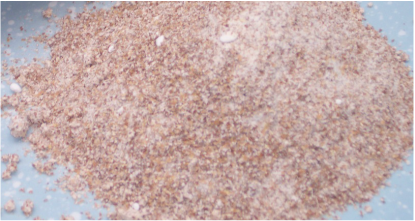 These do not germinate when they are milled into the feed and the moisture levels of the feed are to low to allow for germination. The spores pass through the gut untouched and are deposited into the sediment in the feces. This is where they germinate, directly in the material that they need to degrade. Inclusion of this product into feed is a good idea. It does not harm the shrimp in anyway and actually increases the potential efficiency of our other products simply by allowing for the delivery of high levels of spores into the pond sediment on a regular basis to augment the use of the other products. Adding one kg of our product adds 2 million spores per gram of feed assuming 100% survival. If only 1% survived (lab tests suggest that the spores are largely unaffected by the milling process), then you would be adding 20000 CFU per gram of feed. This is still a relatively large dose of potential sludge degrading bacteria. One kg will add a large number of spores regardless of the survival rate.